I'm a huge cake fan. My family (extended included) celebrates over 10 birthdays in June, and I tend to put on as many pounds then as I do around the holidays. Maybe serving up cakes like the one below will help keep my appetite in check. This cake is brought to us by Cake Wrecks, via both Betsy and Theodosia. It's a naked mole-rat, and it's masterful. Now that I think about it, when I 'search out my feelings,' I know that I'm just fooling myself. Assuming it tastes decent, I'd eat this cake with as much gusto as a German chocolate or carrot or confetti cake. 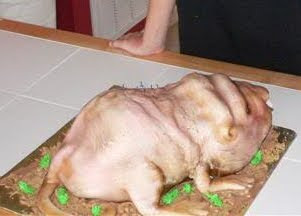 There really is no curbing my appetite, unless you tell me you've infused the cake with the very hormones that trigger the newly chosen queen mole-rat to grow in size, causing her spine to enlarge. That might work. I like my spine the way it is. Zanna, I think the only thing that naked mole rats do is "be gross". . . .and I love them, haha. My husband hates how I stare at them in wonderment at the zoo. They give him the jibblies. If you cooked a mole rat in molé sauce, would that give you a molé rat? I don't think I'd eat it. I know these little nasties are well liked but they just gross me out. 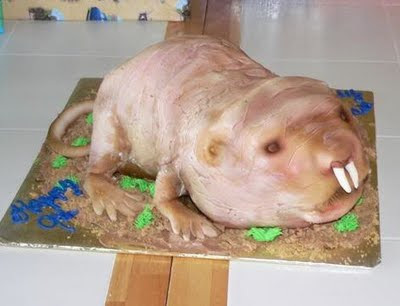 This cake was made for a little boy's birthday...apparently the naked mole-rat is his favorite animal. ...and he wanted to eat one. Go figure.